The first activity of the team was learning the vision of FUNAVID as explained by Dr. Marion Dodson. FUNAVID is dedicated to resolving the fundamental problems of the poor people of this sector of Honduras while improving the environment and sustaining economic gains. We strongly endorse this vision, which involves addressing food production, water quality, and fuelwood supply as primary objectives of the program. The area already has an excellent hospital, which attends medical needs. Beyond the satisfaction of basic human needs, it is envisioned that the region could support improvements in its infrastructure to attract eco-tourism activities that would greatly improve the economic level of the region. The Team was impressed by the vision of FUNAVID and by the convergence of circumstances that can make this project a potential model for the sustainable development of the whole region. In this report we evaluate the technical merits of FUNDAVID’s proposal and suggest a scheme for the implementation of the vision. We start by first providing context for the FUNAVID vision in terms of the US Agency for International Development’s program for Honduras. Then we provide some background on the study site and the partnership efforts, and end with the evaluation of the program and our recommendations. Appendix 3 contains background information on Honduras. 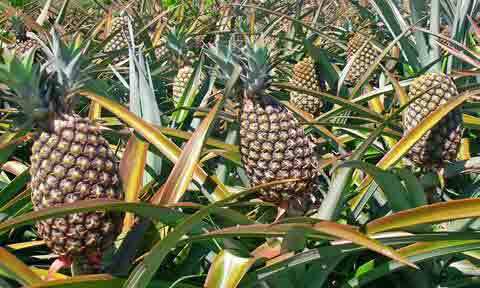 Pineapple is a commercial crop grown in Honduras.